Summary and Definition: The Ute tribe were nomadic hunter gatherers who inhabited lands occupied by the Great Basin cultural group but then migrated to the Plains. The Ute tribe resisted the white encroachment of their lands and came into particular conflict with the Mormons. The names of the most famous chiefs of the Ute tribe included Ouray, Guero, Shavano, Sobita, Tapuche, Mautchick and Buckskin Charley. What was the lifestyle and culture of the Ute tribe? The Ute tribe were originally hunters, traders and seed gathers from the Great Basin cultural group of Native Indians. The word Ute means "Land of the sun" in their language. The Great Basin social and cultural patterns were those of the non-horse bands often referred to as the Desert Culture. However, with the acquisition of the horse many Utes migrated to the Great Plains where their way of life changed to that of hunter gatherers adopting the lifestyle and culture of the horse-riding bison-hunting Native Indians. For full details of the lifestyle, clothes, wikiups and grass houses of the Great Basin Shoshone refer to the article on the Bannock Tribe. For information about the lifestyle of the Plains Native Indians, their clothes and their tepees refer to the Kiowa Tribe. What language did the Ute tribe speak? 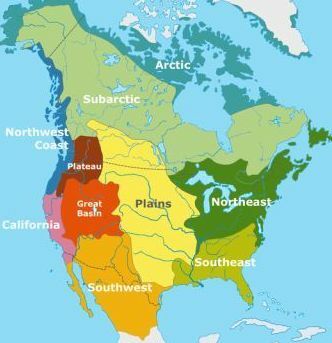 The Ute tribe spoke in a Numic language, formerly called Plateau Shoshonean which was a division of the Uto-Aztecan language. The Utes were originally people of the Great Basin Native American cultural group. The Ute tribe originally lived in the American Great Basin region but with the advent of the horse many migrated to the Great Plains. The Great Basin with its very hot summers, cold winters and very low levels of rainfall resulted in desolate and difficult living conditions in which the people had to work hard to survive due to limited resources. The migration of the Ute Tribe from the harsh conditions in the Great Basin required a totally different lifestyle to suit the climate and natural resources of the area. The lives of the Utes changed from nomadic seed gathers to hunter gatherers who followed the great herds of buffalo. The buffalo was the main source of subsistence on the Plains and the food, weapons, houses and style of clothes worn by the Utes changed accordingly. Who were the most famous leaders and chiefs of the Ute tribe? 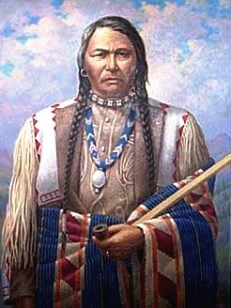 The most famous leaders and chiefs of the Ute tribe included Chief Ouray, Chief Quiziachigiat, Antonga, or Black Hawk, Chief Moara, Chief Pinto, Guero, Shavano, Sobita, Tapuche and Chief Mautchick. The most famous wars that involved the Ute tribe were the 1849 Jicarilla War, 1853 Walker War, 1865 Black Hawk's War led by Antonga and the 1879 Meeker Massacre. Ute History Timeline: What happened to the Ute tribe? The following history timeline details facts, dates and famous landmarks and battles fought by the Nation. The Ute timeline explains what happened to the people of their tribe. For additional facts and information about the Ute tribe refer to the legend and the Story of Ute Wars.